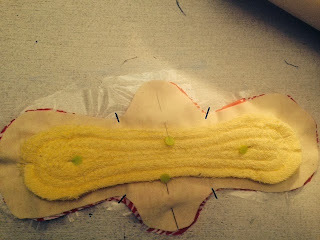 One of the first posts I did on this blog was how to make your own cloth pads. That was a couple of years ago and I've updated my technique since then. There are LOADS of free patterns on the internet. Just google "free cloth pad pattern". I like THIS one from TheEcoFriendlyFamily.com. Google around and find a shape and style that you like. Also, feel free to make your own pattern. I made my first pattern by tracing a pad that I liked. I edited that pattern until it was perfect for me. So please don't feel limited by the pattern link I have posted here. There is a pattern making tutorial on this blog. Using the pattern for the pad body, cut 2. One for the pad top and one for the bottom. Using the same pattern cut 1 layer of flannel. Cut 1-5 layers of cotton terry using the soaker pattern. The more layers you use the more absorbent your pad will be. Added layers also mean added bulk. Stitch your soaker layer together. Stack them on top on each other and run a stitch down the center. This will make them easy to sew to the body of the pad. On the wrong side of the fabric layer flannel and soaker layers. Make sure everything is straight and pin in place. The flannel is there to provide a little extra leak protection. Don't leave it out! Stitch the soaker in place by sewing around the soaker edges. On the right side of the pad, using the soaker seam as a guide, stitch the soaker in place again. This step is optional, but makes for a nice, more professional looking pad. Now, add the back layer. If you are making an all cloth pad, just add the back layer. For a leak proof pad add a layer of pul film or one of the leak proof options discussed above. Line everything up and pin in place. Stitch around the outside of the pad leaving a 2 inch opening. Once you've sewn the outter edge, trim excess fabric around the pad. Be careful not to cut your stitches. Now snip the pad near the wings as indicated below. Make a tiny snip near each wing. Don't cut your stitches! Now turn the pad. Use a chop stick to push out the wings and all corners. Tuck and pin the pad opening. Now top stitch the pad, be sure to close the opening where you turned the pad. Now add the snap or velcro closure! The best tip I can give you about pad making is to take your time and don't panic. It's taken me YEARS to learn to sew a pad that I was happy with. Years! Here is a picture of my first pad! Sewing corners that are nice and even is tricky work and takes lots of practice. Have patience with yourself! If your pads look wonky, make square pads. They're easier to sew. Try LOTS of different patterns until you find the one that's right for your skill level and preference. Also, once you find a pattern you like, make the pattern out of felt or some other sturdy fabric. Paper patterns will rip over time. Felt patterns can be pinned again and again without wearing out. Make your first pads using remnants if you can. Making nice pads take practice, practice, practice! Each woman is so different. What works for one person won't work for another. Play with various soaker material until you find what works best for you. I know people who use layers of old t-shirts or cotton batting for soaker. I also know people who use mircofiber, zorb, zorb II or a combination of materials. It's up to you. CLEAN YOUR SEWING MACHINE after you're done making pads! Little bits of terry will hid inside of your machine. For best performance, use a sewing machine brush and clean your machine (especially around the bobbin area) when you're done making pads! If you don't need a leak proof pad, use a plain cotton backer. For added protection use one of the leak proof materials suggested. Play with the various options and see what works for you. Machine Wash pad before first use. Store soiled pads in a "wet bag" until you are ready to wash. Place soiled, unfolded pads in the washing machine. Wash 1 regular cycle in cold water with NO SOAP. For the second wash cycle, pre-treat stains with liquid detergent or other stain remover. Wash in HOT WATER with your regular laundry detergent. NEVER USE FABRIC SOFTENER on your cloth pads. It makes them less absorbent. For the first wash cycle, wash JUST THE PADS. For the second wash cycle you can add towels or other laundry to the load. Wash the wet bag in the second wash cycle. Click HERE for a printer friendly version of this pattern! To whom much is given, much is required. It is in that spirit that I offer you this next bit of information. to choose an organization that is accepting donations. Donation information comes from the website Sew In Peace. This is not my religion or my church. I just really love the idea of donating to young women in need. Each February, our church participates in a short-term mission trip to Haiti with Mission Possible. The purpose of this outreach is to share the love of God and help the poor through education. One area of the outreach includes educating girls about their menstrual cycles and proper body care. 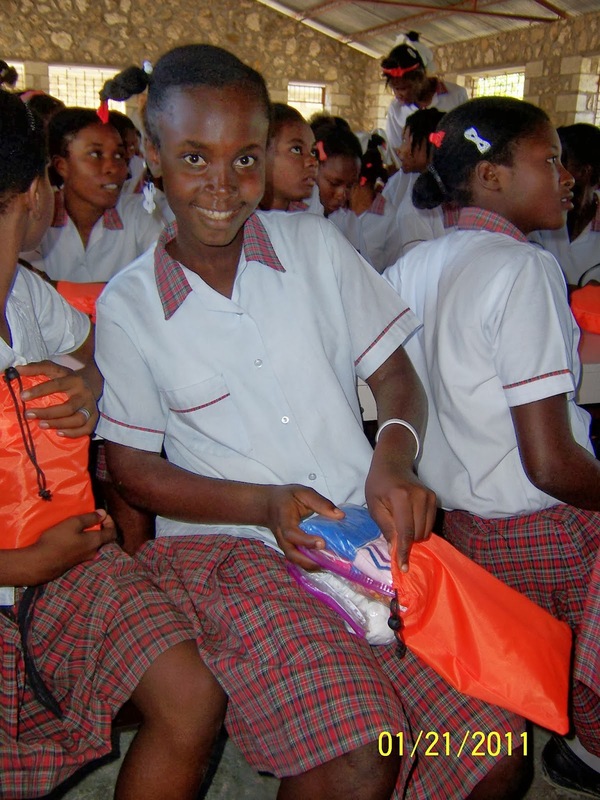 Girls are provided Feminine Hygiene kits that contain supplies to use during their monthly cycle. This simple kit will not only improve her health, but will also enable her to remain in school 45 more days per year where she can continue to learn. Education is the key to providing hope. Along with basic hygiene information, each kit contains 2 bars of soap, 3 pair of underwear, 100 ibubrofen tablets, 5 safety pins, and 10 cloth sanitary pads. Last year 5,000 sanitary pads were donated for this project, and the hope is to expand the outreach to more girls in the future. In addition to prayer and financial support, Mission Possible is looking for volunteers to sew reusable pads for the feminine hygiene kits. Would you personally consider donating your time to create 10 pads? Perhaps you know of a 4-H club, a quilting group, a retirement community, or a church sewing ministry that is looking for a service project. Your generous gift of time will make a significant difference in the life of a young girl in Haiti. Thanks! I had never thought of doing this. We had five daughters + myself in our household in the 90's and doing this would've saved us loads of money! Now I am happy to have read about this and will pass on the idea & patterns to my girls. It stands to reason too that this will help with incontinence, which is sometimes an issue with we ladies in our 50's and up. Thanks again. I'm forty, and sometimes feeling like kicking myself for all the years wasted not knowing about this stuff. It angers me also that no one thought to get the word out more on reusable menstrual products. Now that I'm forty, I feel as though I have only a few years left now, and that it's almost a waste of money and time. It's never too late. You can still use pretty pads while you're still getting your period. I just discovered menstrual cups last year. I'm annoyed that I just found them last year but i'm enjoying the heck out of my cup! The link for the pattern doesn't work. I really like the look of these ones. Where can I find the pattern. Thank you! Give me a second and i'll check it out. I have updated this blog post to include a pattern that works from TheEcoFriendlyFamily. Hope that helps! You can do so many things with your sewing machine, Like sewing of new clothes, repairing work of the torn clothes, alterations of the dresses and many more things you can do with your sewing machine, You can do beautiful quilt on your dress if you have quilting knowledge. I just like quilting my new clothes as a fashion designer I am used to of doing this things. You can visit here to get more info about best sewing machine 2018.
thanks for sharing this info with us.